I was gutted I missed out on seeing Tooting Arts Club’s Sweeney Todd at Harrington’s Pie and Mash Shop last year. Sweeney Todd is one of my favourite Sondheim shows and the idea of seeing it in an actual pie shop sounded simply fantastic. So once a transfer to the West End was announced I just had to book tickets despite a rather steep rise in ticket prices. Harrington’s has now found a temporary home on Shaftesbury Avenue, right next to the Queen’s Theatre. You enter through an unimposing door and quickly find yourself in the theatre bar. This is where the magic starts. The whole room has been decorated with old photos and drawings of barber shops and the like. One frame shows the letter Sweeney Todd sends to Judge Turpin, a prop from the original production which has even been signed by Stephen Sondheim himself. The auditorium is a replica of Harrington’s Pie and Mash Shop. The audience sits on benches which are fitting for the location but are not going to win a comfort award. The biggest issue with this kind of seating is the view though. Even those seats that are not classed as restricted view will require some turning around and leaning in order to catch all of the action. However, what the show lacks in comfort it makes up in atmosphere. Watching the story unfold around you really is a unique experience. 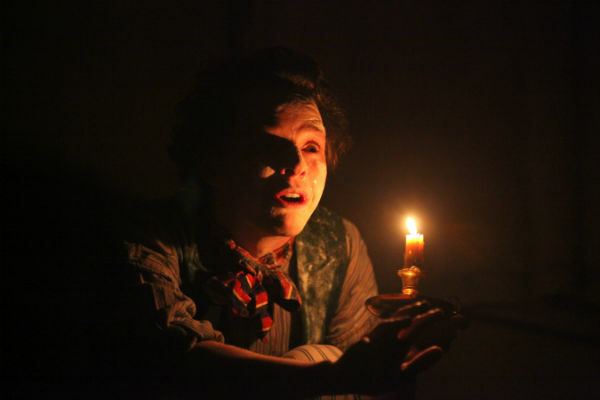 You might find yourself up close with Sweeney Todd or Mrs. Lovett. Or maybe Tobias will use your head to advertise Pirelli’s miracle elixir. Jeremy Secomb leads the cast as Demon Barber of Fleet Street. His Sweeney Todd is dangerous and full of hate. He sees nothing but his need for revenge. Jeremy Secomb sings the challenging score with ease and is by far the most raging Sweeney I have seen so far. That combined with the small space the show is performed in makes his portrayal intense and gripping. Siobhan McCarthy’s Mrs. Lovett is loud, forceful and at times almost cheerful. She is the perfect counterpart for Jeremy Secomb’s angry Sweeney. The rest of the cast is strong and works well in this site specific production. 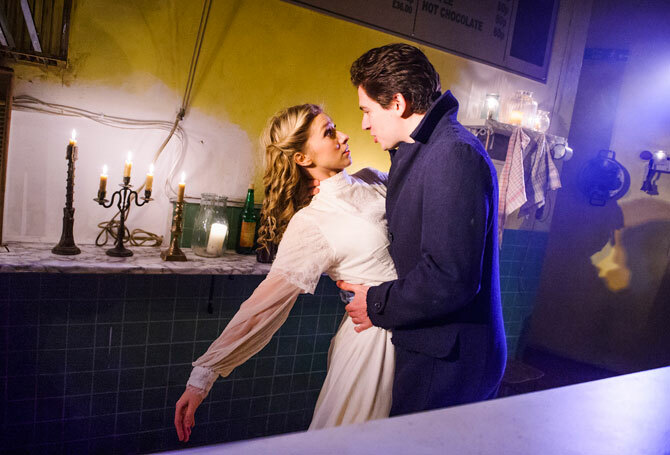 Especially Nadim Naaman’s Anthony and Zoe Doano’s Johanna are amongst the best portrayals I have seen of both parts. One of the things that surprised me the most was the sound. What musical director Benjamin Cox has achieved with just piano, violin and flute is impressive. Those three instruments in combination with eight strong voices definitely do the score justice. Most murders are pulled off with a sudden burst of red light while Pirelli is strangled in the middle of the audience (literally). The use of red light instead of blood does not make the actions seem less gruesome and brutal and when Sweeney Todd reappears after a murder with blood on his face you can’t help but shiver. The intimate nature of the performance make key aspects of the story feel even more intense. When Anthony sits next to you yearning for Johanna or Tobias stares straight into your eyes while singing about murder you do experience a deep connection to the characters. If I could change one thing in this production I would have the performers stay in character when they mingle with the audience before the start of the show and at the end of the interval. Personally I think that would make the whole experience even more gripping and would give the audience a chance to be a part of the world of Sweeney Todd. But this is no criticism of the show as it stands and I highly recommend you go and check this production out. If you enjoy Sondheim and want to see one of his most famous shows like you’ve never seen it before you have to visit Harrington’s Pie and Mash Shop at its temporary home on Shaftesbury Avenue. And yes, you can get pie and mash there before the start of the show but it needs to be pre-booked so make sure to take that into consideration. 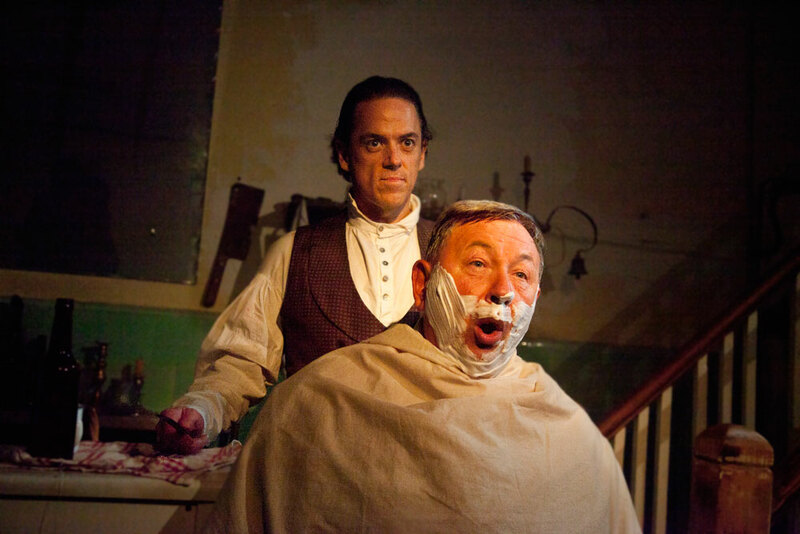 Sweeney Todd at Harrington’s Pie and Mash Shop on Shaftesbury Avenue is running until 30th May 2015. Book your tickets here and make sure to check out the work of Tooting Arts Club.